Mickey Hot Springs scenes might not be as gigantic as Yellowstone National Park, but the colorful hot pools inserted naturally among a series of small boiling mud pots, hissing vents, and the only natural mini-geyser in Oregon, a unique and picturesque geothermal zone. Located at the northern edge of the Alvord Desert, to the east of the Steens Mountain, the miniature Oregon Yellowstone area is among the most notable features of Southeastern Oregon. The temperatures of the thermal pools vary from year to year and can be as much as 206°F (97°C). The largest glassy pools 20 feet in diameter and 10 feet deep with yellow-green-orange edges have the temperature between 120-170°F (49-77°C). The small streams flowing through grasses heat up to 180°F (82°C) cooling down farther from the source. The hot springs area is dusted with sodium borate. According to BLM, sodium borate or Salt Flat is safe for contact. Cautions: The scalding temperatures, steam, and fragile ground surface make soaking in Mickey Hot Springs unsafe. The posted by Bureau of Land Management signs warn about this area dangers: Injuries and death have occurred to pets and humans. Keep your children a safe distance away from the edges of pools. If you have dogs with you, keep them on a leash. Watch your step, the thin ground surface could break under your weight and expose you to boiling water. In October 1996, Kevin Williams went to the southern pool to watch the lunar eclipse. He died from hypothermia. In April 2017, Brent Torchio from California received second- and third-degree burns over 20 percent of the body, while rescued his dog Remnar. The dog jumped or fell into a near-boiling water of the geothermal pool. The dog died later in an animal hospital. 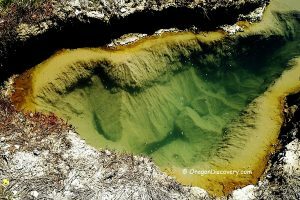 From a geological point of view, Mickey Hot Springs is simply a series of small hot-spring systems with relatively basic landscape scenery in southeastern Oregon. That, however, is until you go there. Witnessing first hand, the natural mud pots bubbling amid well-patterned choreography of hissing steam vents, is always a moment to remember. Add to that profile the fact that the springs are now a scientific mastery of a unique environment with sodium borate (borax) deposits in the soil, and you have a tourism hotspot becoming increasingly popular. This means that visitors find most of the geothermal pools available are too hot for soaking. However, browsing the environment, basking in the steam vapors, and harvesting the benefits of a mineralizing ecosystem is a wonderful and memorable outdoor experience. Most notably, however, the hot springs are gaining unprecedented attention today for a unique environmental profile. Indeed, the scientific significance of the region is what is driving researchers to Mickey Hot Springs. Here they are able to study the mineralization process of thermophiles living in a slightly alkaline hydrothermal system. Scientists have been able to identify and collect an overwhelming arsenal of thermophilic bacteria from the spring's outflows. 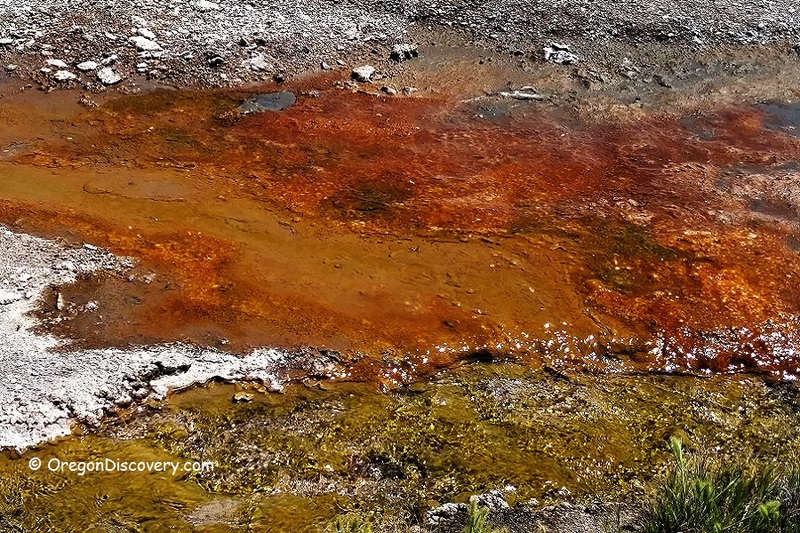 Thermophilic microbes growing within the hot springs form distinct colonies distributed on the basis of temperature and the ratio of chlorophyll and carotenoids. The eye-catching colorful spectrum is just a variety of pigmented bacteria of the microbial mats. The blue or green color in the middle of the pool is clear, almost bacteria-free scalding water at 180°F (82°C) and higher. When water is cooled down at the edges, different thermal conditions provide growing of various species of bacteria. The green and yellow rings are formed at temperatures below 165°F (74°C) by cyanobacteria Synechococcus. Photosynthetic pigments of the bacteria (chlorophyll) are responsible for green color. When temperature gradually drops, chlorophyll is masked by carotenoid pigments (related to vitamin A), producing yellow, orange, red and brown colors. The yellow and orange bands are cooler, below 150°F (65°C) and contain both chlorophyll and carotenoids. The red-brown area is the coolest part of the springs around 130°F (54°C). This area contains carotenoids pigments such as Cyanobacteria Calothrix (contribute dark brown hue) and Deinococcus-Thermus (contribute red color). Mickey Hot Springs have a water pH that ranges between neutral and slightly alkaline. Having an ecosystem extremely friendly to thermophilic organisms, packed in a mineralizing environment, and then sustaining bacterial life with a precision of different temperature stratum makes the springs a rare natural occurrence. Consequently, Mickey Hot Springs have now been designated as an Area of Critical Environmental Concern by the US and placed under the management of the Bureau of Land Management, Burns District. Unfortunately, scientists have deemed the attractive hydrothermal masterpieces as progressively waning, towards extinction. Perhaps this explains why 11 among the 60 steam vents are already dry. It is therefore important that you plan your visit soon, to witness and cherish the rare and unique natural masterpiece of Mickey Hot Springs, soon. Enjoy the mineralizing environment before it is too late. 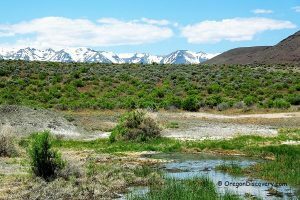 To get there, you will drive to the remote Harney County, on a 6-mile gravel road on the east side of the Steens Mountain. The springs are relatively accessible and always welcoming to visitors looking for a brief outdoor experience, Oregon style. 386 miles southeast of Portland. Mickey Hot Springs is nestled southeast of Mickey Butte. Turn left onto the Mickey Hot Springs access road and follow 6.9 miles east around the southern edge of Mickey Butte to the parking area near a BLM signboard. Turn right onto the Mickey Hot Springs access road and follow 6.9 miles east around the southern edge of Mickey Butte to the parking area near a BLM signboard. Fields-Denio Road (East Steens Road) is accessible all year by any types of vehicles but the Mickey Springs road may become inaccessible during rainfalls. Alvord Hot Springs: Soaking, camping. Mann Lake: Fishing, camping, hiking, rockhounding. Borax Lake Hot Springs: Viewing, hiking. Willow Creek Hot Springs | Whitehorse Ranch Hot Springs : Soaking, camping, hiking, wildlife viewing. Barnes Warn Springs: Soaking, hiking, wildlife viewing. Virgin Valley Hot Springs in Nevada: Soaking, hiking, wildlife viewing. Bog Hot Springs in Nevada: Soaking, hiking, wildlife viewing. 2. Oestreicher, Z. 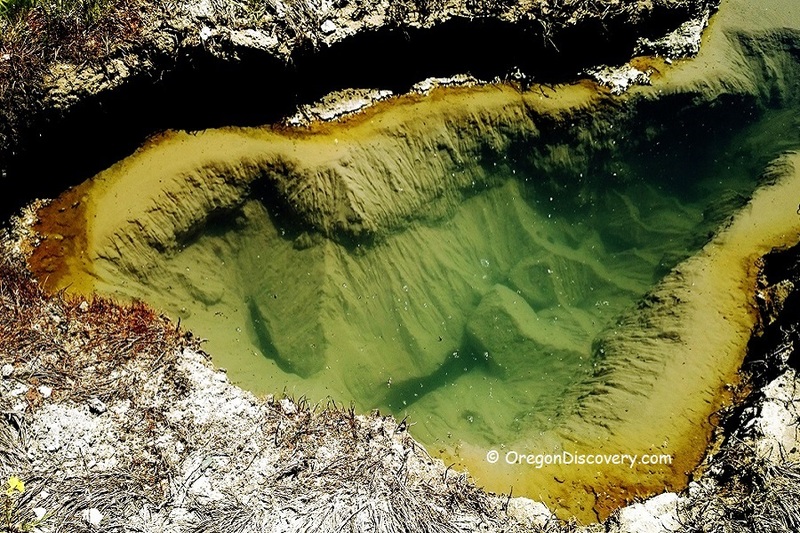 "A Unique Bacterial Mineralizing Environment At Mickey Hot Springs, Southeastern Oregon". 2003. Presentation on Geology, 2003 Seattle Annual Meeting. Seattle Annual Meeting held on 2 – 5 November 2003, at Portland State University. Session No. 82, Booth no. 53. 17 Cramer Hall, 1721 SW Broadway, Portland, Oregon. 3. Koski A.K., Wood S.A. "The Geochemistry of Geothermal Waters in the Alvord Basin, Southeastern Oregon". 2004. Taylor & Francis Group, London. 4. Jessica Ball. 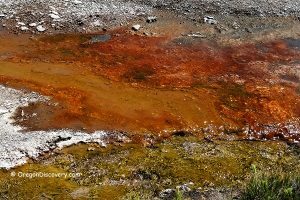 "Yellowstone hot springs: Upsetting your color scale". 2016. Link.